At The Little Nell, it’s important to us that every guest has a memorable visit – including pooches! Through our petiquette program, pets are treated like family. We offer a special pet menu, jet lag kit, silver bowls, comfy beds and lots of attention. 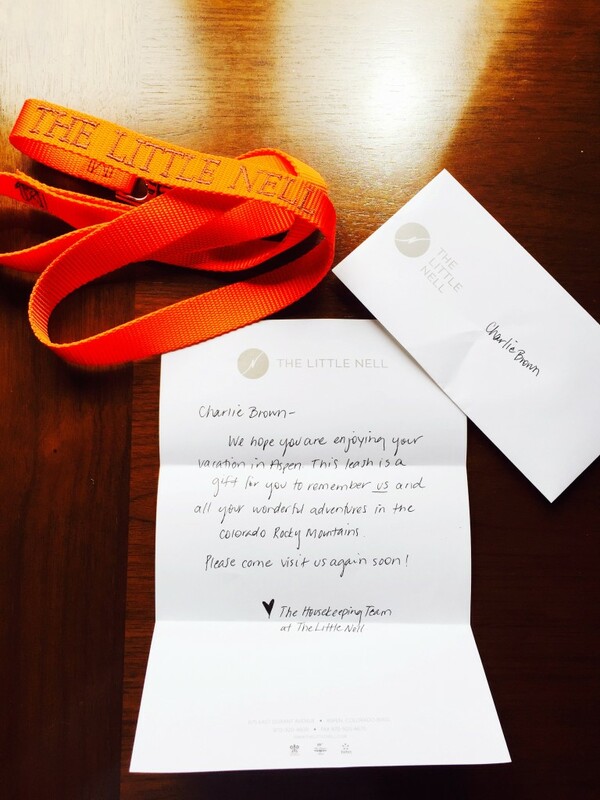 This summer, writer Abby Miller (a.k.a Denver Darling) visited The Little Nell with her beau and golden retriever, Downtown Charlie Brown, sharing details of their stay with us below. Q: How old is Charlie Brown, does he travel much and where has he been thus far? A: Charlie Brown is 9 ½, but still acts like a young pup even after two ACL surgeries. He is our furry child and goes with us everywhere, whenever possible. He hasn’t traveled much outside of Colorado because he is a hefty 100lbs, so it’s hard to take him on the plane (but we absolutely would if we could)! So we do as many Colorado getaways and staycations as we can, allowing him to travel with us. Q: What does he look for in a hotel? A: Charlie is a pretty simple pup. We live in downtown Denver so he doesn’t get out as often as we’d (or he’d) like during the week. When searching for hotels, we consider the proximity of activities for him, such as hiking, swimming and parks. The Little Nell had all of these when we were doing our research. Great hikes in the area, parks nearby and lakes for swimming. Additionally, he likes to be able to enjoy the comforts of home while mom and dad are away. He really enjoys a comfy bed and knowing that someone is there to take him out if necessary. Q:What did he enjoy most at The Nell? A: Charlie really enjoyed the staff at The Nell. On Saturday and Sunday, while mom and dad enjoyed ourselves, the valets at The Nell took Charlie on walks, played with him and gave him a new ball and leash. He was in doggy heaven! Q: Are there any memorable stories from his stay? A: On Sunday after we checked out, Charlie hung out with the staff for two hours while we enjoyed brunch at element 47. He got a new ball and was very sad to leave his new friends! Also, while we were away at dinner and our room was being cleaned, a valet came and walked him so he would be comfortable during that time. They left us a lovely note so we could find him upon our return. He really enjoyed this. Q: What did he feast upon on the pet menu? A: Although Charlie enjoyed the people at The Nell most, he could not get enough of the pet menu…OMG! He gobbled every bite up in seconds, and was very disturbed when we got home and returned to his plain kibble (sorry, Charlie). He sampled both the chicken with brown rice and carrots entrée and the tenderloin with eggs, and loved them both. Q: How important is it to you to bring your dog on vacations/getaways? A: It is incredibly important to bring Charlie with us whenever we can. He is a member of our family and we plan most of our trips around finding a dog friendly property so he can join us. We can’t wait to bring him back to The Nell! Book your next trip with your pet at The Little Nell by calling 970.920.4600 or emailing stay@thelittlenell.com.